Professional Painting Thornlie can improve the ambience of one of Perth’s most beautiful and leafy suburbs. A well-maintained and smart looking home will increase in value. It will also make you beam with pride as a proud home-owner. Your local Jim’s Professional Painter understands the area well. They know how to add pizazz to your home or business while keeping with the true essence of Thornlie. Jim’s Professional Painting Thronlie have the expertise to transform any backyard into an outdoor oasis. From fences, decks, retaining walls and sheds through to entertaining areas, gazebos, pergolas, and patios. No matter what the surface, we can transform it all. By painting, staining and decorating these areas with stunning finishing touches, Jim’s Professional Painting Thornlie take your backyard from drab to WOW! If you are lucky enough to own one of Thornlie’s original homes from the 50’s, 60’s or 70’s, it’s probably time for an update. Our painters have a lot of experience in all types of renovation painting. We can achieve the unique look you desire. We also appreciate the importance of proper preparation. Our team will focus on repairs such as filling minor cracks and holes. After all, under every great paint job, is an even greater properly-prepared surface! Jim’s Professional Painting Thornlie are a popular choice. We have been engaged to paint many new homes being built in the up-and-coming housing estates. Perhaps you desire a modern look based on international trends and colour forecasts. Or, you have your heart set on your own personal colour combinations and ideas. Don’t worry, we have the prowess to do it all! We save you time. 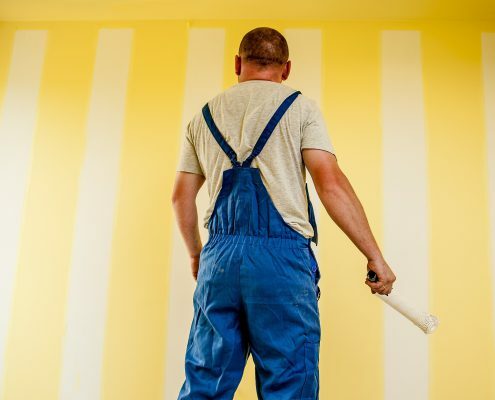 While DIY painting may be in vogue, it’s wise to consider what your time is really worth. Avoid reworks. Jim’s painters are experts in every sense of the word and will achieve a professional look the first time, every time. Skills and Experience. Our professionals have been fully trained and know how to apply correct techniques for different jobs. It takes knowledge and experience to achieve our superior finishes and results. Professional Equipment. Jim’s Professional Painting Thornlie have a full range of specialised painting tools and equipment. We have all the professional tools suitable for any job. We also know which tool is needed to achieve the best result. Your friends will be envious of the outcome! Professional Products. Professional painters intuitively know which products will be right for the job and provide long lasting results. All our painting and staining products are backed by the manufacturer’s warranty. Customer Satisfaction. Above all, the most important benefit of hiring a Jim’s Professional Painter is that we guarantee 100% customer satisfaction. We’re not happy unless you’re happy. With Jim’s Professional Painting Thornlie you are guaranteed the highest quality paint job from start to finish. We have cost effective painting solutions and undertake quality assurance measures. Many people choose the Jim’s network because the name is synonymous with quality. It’s a reputation we’ve earned and we’re proud to uphold. So, put all your worries aside and give us a call today on 131 546 for an obligation-free quote and a hassle-free, high quality paint job!